Sometimes as mothers I think we forget we need sleep.... well at least I do. I have so much to do on a daily bases. When the lights finally turn off in all four of my children's rooms I make it a point to be done..... well mostly. I sit down. I relish in the fact that no one needs anything from me. I do what I want. I eat what I want. I breath. Nine turns to ten and ten turns to eleven and soon after it is 1am. In that moment it feels so good. It fills my cup...... until the next day. This summer has been interesting when it comes to sleep. The boys have finally decided that sleeping in is a good thing and think that in turn they should stay up later. Makenzie has been able to stay up way later then she has in any past summer and our sleeping schedules are WAY off! About two weeks ago I finally put my foot down and made a mandatory 10pm bed time for all children. I needed my alone time. I needed my alone time to start and end earlier. It worked well. Until I decided to let them stay up late again the other day and I found myself up still at 2 am. Then the night after that Makenzie did not have a good night and once again I found myself up at 2 am. Yesterday I found myself snapping at everyone in my path. We were supposed to get the Taos Walker yesterday but there was an issue with the foot plates.....you would have thought the world was crashing down. The pharmacy had not filled a script that has been in their hands since Monday so the store manager got a call. Two of my kids thankfully were in the mountains and the other at a friends so they missed all of the cranky mommy fun! About half way through the day I finally just decided that the world would be a better place if I took a nap. Last night the boys were still away and I put Makenzie to bed. I sat on the couch. There was nothing on TV but I watched it anyways. I caught up with a couple friends and then I headed to bed. Makenzie slept much better and I got up this morning feeling much better. Makenzies medicine is ready at the pharmacy. Her Taos will be ready and fitted by Monday evening and the world is right again. I am rested. How do you stay rested while also having some "me" time? Almost 10 years ago we bought a home. It was a beautiful four bedroom three bath home. It had a two car garage, unfinished basement, and a HUGE yard! It was perfect for a family with three growing boys. The school district was great and I was so excited that after 4 moves up on the real estate ladder we had finally found a home that I could finish raising my kids in. I was NEVER moving again. A few years after purchasing this perfect house Makenzie was conceived. We took down the the car wallpaper boarder. We then painted what was my youngest son's blue and bright green bed room a pastel pink and green complete with a new butterfly and flower boarder on the the wall. My son got moved into his big brothers room and we were ready for a new baby girl. Our home was still perfect. After Makenzie's accident we started talking about wheelchairs. At the time Makenzie was still a baby. For a couple of years I could just throw her over my shoulder and haul her anywhere. I didn't give the multitude of stairs in my home much thought until Makenzie started walking in her gait trainer. Then she got a real wheelchair and started spending more time in it. She loved to be upright and able to see the world not to mention it was much better for her body then laying in a ball on the floor. The stairs became a big problem. Our home went from perfect to anything but overnight. Ten years into a mortgage I planned to see to maturity I was faced with a huge delima. My goal to pay off my home at a reasonable age started to fade with each passing day. I became very clear that one day my once perfect house would be need to be sold and a new home would need to be attained in order to continue to care for Makenzie. This became a weight I carried around for several years and was never far from my mind. Shortly after the first of the year God took my fear and worry. He opened door after door. God provided us first with the perfect home for our families new needs. Then He provided the means to widen hallways and doorways. He provided brand new floors and an air conditioner. He provided the man power and generosity of a single company to get it all done in less then three weeks. To put icing on the cake God then provided a full price offer on our now less then perfect home. On Friday afternoon we finally closed on our old house. There were no issues and in less then an hour the papers were signed and the key was handed over. DONE! A flood of emotions came over me driving home. Some of it was realizing that our home now officially belonged to someone else but most of my raw emotion was realizing yet again how faithful God has been. It was the final piece in moving on with our lives and the not so new normal our family now lives. Today Makenzie can walk through her whole house. She can easily be taken anywhere we are. She now has her own room to keep all of her special stuff in and soon a beautiful mural will be created on her walls. We are waiting on funding to redo a bathroom that will be complete with a roll in shower, a tub that will accommodate a lift in the future and an accessible sink and toilet. 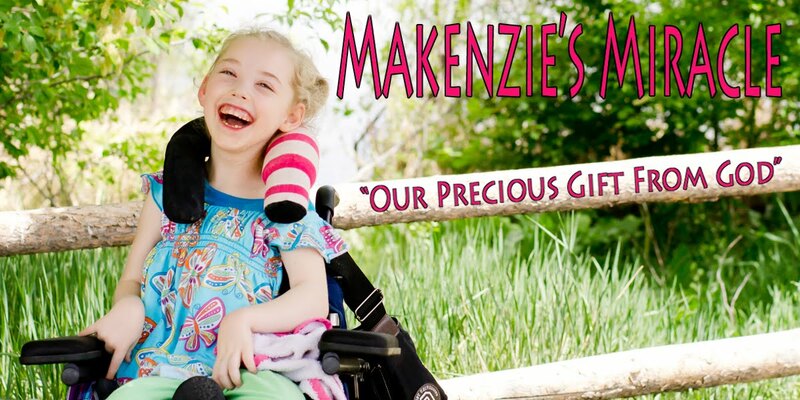 There is a beautiful deck with a ramp built just for Makenzie out back which leads to a park in which Makenzie rolls around in her power chair. Our house is cool in the heat of the summer and every day something new ends up on the wall making this house feel more and more like a home. God is good! Only He knows what perfect is and man oh man does He ever do perfect well! To God be all of the Glory! This morning I decided it was high time to get our home in order. After having friends live we us for 2 months and then out of state company on and off for a month the house needed some attention. I would love to say we all sang Kumbaya in harmony all morning while cleaning up but that would be a lie. However, in the end after much whining, fighting, and lallygagging, the house is clean..... for at least 12 hours that is. As soon as we were done we loaded up into the van and went to a family picnic. The weather was perfect. The food was great and the company was awesome. The boys however went straight to the lake which contained many little clawed creatures. Creatures that make this mommy's skin crawl. Creature which some eat but really in my opinion should not even be touched. Ode to the Crawdad....... YUCK! The hunt was on! Armed with sticks, string, and hot dogs they went to work. By the end of the evening the blue bucket was full of grossness in all sizes. They were over the moon! Makenzie and I sat with the rest of the family and ate dinner. We caught up with people we only see once a year. Makenzie showed off her talker and had a ton to say. I am going to regress for a second on the talker. Over the last month Makenzie has been trialing a eye gaze device that has the technology to scan her retinas through a camera and allows Makenzie to make a direct selection with her eyes. She rocked it and made more progress with the eye gaze in 4 weeks then she did in over two years on her current device. We have looked at two different devices and will look at a third the beggining of August. I am pretty sure we know which device we are going to order but I want to see all of our options before we make a final decision seeing as the device costs about $30,000 and insurance will only purchase one device every 5-7 years. On Monday we had to return the said device. We were busy with Granny and Paw Paw so I didn't give it much thought when we put it back into the box and watched it walk out the door. However after the dust settled, I realized that Makenzie would have to go back to the painfully slow scanning and switch pushing which makes both her and I crazy. Her therapist suggested that we mirror her current device to look just how we had set up the eye gaze. She hoped that this would let Makenzie continue to learn how to navigate the device and memorize where all of the pages are located so that when her eye gaze comes, Makenzie will have a head start. So I spent several hours on Thursday afternoon mirroring the device. On Friday morning I put it in front of her. She looked at it. Then she looked at me with a very confused look on her face. I explained to her that this talker did not work with her eyes.She looked at me and fussed and then refused to even look at her talker. She even refused to activate her remote control toys. Later that evening when I was putting Makenzie to bed and we were talking about our day I asked Makenzie if she was upset that her talker didn't work right. She looked at me and made the biggest pouty face and then began to cry. I cried with her. I then asked her if it would make her feel better if Mommy could make it work with her eyes again and she immediately stopped crying and started to smile and laugh. I cried again knowing that it would not be just a simple or remotely quick fix. See those little hands up at her chin? We have worked so dang hard to bring them down and relax. Putting the switch back behind her elbow means that Makenzie has to flex to get to it which in turn seems to be reinforcing a very very bad pattern. CRAP!!! Well, I guess that was a whole post in and of itself. Needless to say we had a great evening with family and friends. The boys had a great time catching crawdads and skateboarding. We came home to a clean house which felt great. I am sure my bed will feel pretty good too. In fact I think I might go find out. The last couple of months have been so full of fun, friendship, and lots of activity. The last couple of months have also been full of much thought about priorities and what is most important in this life. They last couple of months have been full of reflection on where we have been, where we are currently and where we are going. The last couple of months have been amazing! I have had some feelings and emotions running around in my head that I just couldn't put my finger on. I felt like the gerbils were running all different directions in my head. Last Sunday I went to church for the first time in who knows how long and the message was on contentment. The pastor asked us to think of something... anything ..... that we coveted. Not just something we wanted but something we felt we could not be happy without. I couldn't come up with anything. I want lots of stuff. I want new clothes, a modified bathroom and van. I would love to remodel my kitchen and a ramp to my front door would be great. However, there was nothing I could come up with which I had to have in order to be truly happy. It was then that the gerbils in my brain all stopped and began running in the same direction. I figured it out. I am happy. More then happy.... I am content. I have a great support system. I have so many friends and family who do their best to understand my life and I have met so many wonderful people in the last four years who actually do understand my life. Each and every one of these people love me for exactly who I am.... nothing more, nothing less. One of these people, my friend Michelle, came to visit the beginning of July . My friend who I met only a few short days after Makenzie was discharged from the hospital at the Ronald MacDonald Resort and Spa in Arizona. Two women who were not looking for a friend but looking for healing where brought together. Healing we found in the miracle of friendship! We spent 10 days together. We watched fireworks, we lit fireworks, we went to target and Whole Paycheck. We went to see Cars 2. We visited two different malls, the Museum of Nature and Science, and the train museum. There was a birthday party at the bowling alley for Makenzie and DJ and we even took a ride down to Union Station on the light rail grabbing a bite to eat at the Hard Rock Cafe before heading home. Then of course there were the VERY late nights spent talking, laughing, and shedding a few tears together. I realized something while Michelle was here in the midst of everything we were able to do. I realized that the life I thought was forever lost was starting to be found again. I realized that I had my feet planted on both sides of the proverbial fence. My life will always be sprinkled with wheelchairs and talkers. There will always be IEP's and medical equipment. I will always be proud to be a member of the special mommy club however, there is more and more pre accident life shining through every day! Staycation 2011 from makenziesmiracle on Vimeo. After Michelle left, Makenzie's Granny and Paw Paw came to visit. We visited a ton, went to the mall, the American Girl Store, the boys did some fishing, shooting, and swimming. We BBQ'd twice and played a few games of pool. We had a GREAT time!!! Makenzie's Granny and Paw Paw have loved her very intensely from far away for four years. The last time they saw Makenzie in person was when she was still in the hospital. Watching them with her made my heart melt. They love her so very much. Goodbyes are so dang hard! I want Makenzie to continue to heal..... that will never change....... but I do not need her to be any different then she is today for me to be happy. I trust in God's plan and know that He continues to place His almighty healing hand on my little girl! That is enough! The train museum + a kiddo who LOVES trains = a prop sure to provide many wonderful pictures! Every life deserves to be celebrated. Every one of my children are a miracle. Every birthday is breath taking. Today it was Makenzie's turn to be celebrated. A time to celebrate her birth. A time to celebrate her near death and gallant fight for life. A time to celebrate the many ways she has defied the odds and proved so many doctors wrong. A time to celebrate and a time to watch Makenzie not only live.... but live well!!! I am so grateful for each and every day of the last six years I have been Makenzie's mommy! We had many friends and family come to our home this afternoon to celebrate Makenzie. Preparation included a late night family cake making and decorating adventure. The boys helped make frosting and also help carefully assemble and decorate the cake. They also decorated a cake just for Makenzie to eat play in. We had a great time in the kitchen and I think when all was said and down we had used about 12 sticks of butter and almost 5 cups of sugar. Cake is true health food! Makenzie LOVED all of the balloons. She followed them all over the place. She laughed and giggled when they hit her in the face. I think if she could tell ya she we say that the balloons were her favorite part of her celebration! We ate and laughed. We celebrated Makenzie. Then it was time for cake!!!! What a fun cake to make and oh so fitting for Makenzie! Of course Makenzie had to have some cake and get a little messy! Cleaning that up was a ton of fun but oh so worth it! Watching Makenzie enjoy using her arms to get messy never ever gets old! After we got all of the cake and frosting off of Makenzie, the tray, the chair, and the floor, she was ready to open her presents! I read her every card. Makenzie enjoyed feeling them and looking at the bright pictures. Thank you to each and every one of you who shared in this day with Makenzie and our family!!! It means more to us then words could ever express!!! !